Many credit cards are great for spend within certain categories, but not great for spend everywhere else. For example, the Citi Prestige card offers 5X ThankYou Rewards for airfare, dining, and most travel agencies, and 3X for hotels and cruise lines. That’s great. But, I don’t recommend using the card for spend outside of those categories where it only earns 1 point per dollar. You can do better. Separately we posted: Best Category Bonuses: Which card to use where? There you’ll find the best cards to use for many different types of purchases: grocery, dining, travel, etc. Here, you’ll find the cards to turn to everywhere else. You get the idea. The US Bank Altitude Reserve card deserves special mention. This card offers two 3X categories and then offers just 1 point per dollar everywhere else. Points are worth 1.5 cents each towards travel. So, as a pure “everywhere else” card, the Altitude Reserve is actually not great at all. You can do much better than 1.5 cents per dollar value. The reason I’m highlighting it here though is that one of its 3X categories is “mobile wallet payments” (travel is the other 3X category). Mobile wallet payments include all payments made with Apple Pay, Google Pay, or Samsung Pay. That’s an incredibly broad category. Mobile Wallet payments, such as Apple Pay, are accepted at a huge number of stores around the world. And, everywhere you use the Altitude Reserve in this way, you get the equivalent of 4.5% back towards travel. That’s awesome! Within the US, you can use mobile payments at most big-box stores, most supermarkets, most warehouse stores (such as Costco), and much more. Those with certain Samsung devices (with MST technology) can even use Samsung Pay at terminals not equipped for mobile payments. Nick previously wrote about using his Samsung watch in this way. Caution: US Bank has been known to shut down accounts of those who buy large value gift cards (e.g. $500) or large numbers of gift cards via mobile wallet payments with their Altitude Reserve card. The following cards (at least the top 25 or so in the list) offer great rewards regardless of where they’re used. Our entire database of credit cards is contained below, shown 10 cards at a time, and sorted with the best everywhere-else rewards on top. For the purposes of this post, please train your eyes on the boxes titled “Base”. These show the base earning rate (aka “everywhere else” earning rate) for each card. For cards that earn points instead of cash back, we’ve listed the “X” which is the number of points per dollar earned. For example, “2X” means that the card earns 2 points per dollar. Cards are sorted by the value of the “Base” rebate in descending order based on our Reasonable Redemption Values (RRVs), or by their fixed redemption value with cash back cards. Fixed Value Cards: Capital One Venture and Spark Miles cards earn Capital One “miles” that are worth exactly 1 cent each when redeemed for travel. So, when you look at a card that earns 2 “miles” per dollar you would expect to see 2% as the base rewards rate. Instead, you’ll find a higher percentage because Capital One Miles are transferable to airline miles at a rate up to 2 Capital One Miles to 1.5 airline miles. 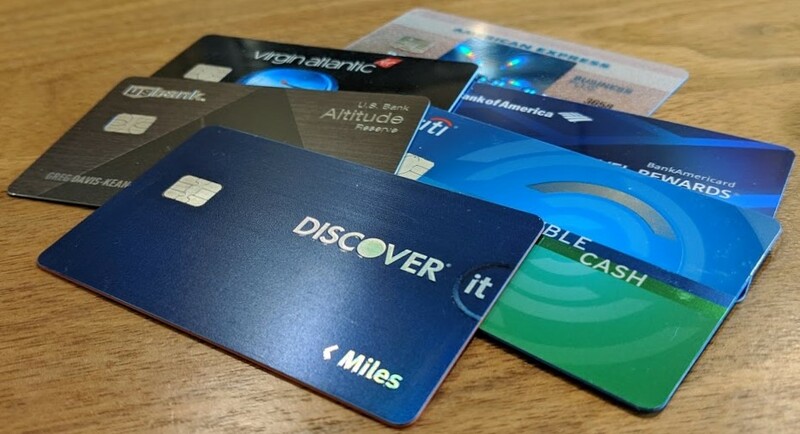 Cash Back Cards: Some cards are advertised as cash back cards, but actually earn points that can be converted to airline miles or hotel points. For example, the Chase Freedom card is advertised as a cash back card where points are worth 1 cent each. However, if you (or another household member) has a premium Chase card (Sapphire Preferred, Sapphire Reserve, Ink Business Plus, etc. ), you can move points from the Freedom card to the other card and then transfer those points to airline or hotel programs as needed. @Greg- Once you spend $50k on Amex blue business, does it make sense to use the Capitol Spark card for rest of everywhere spend? What would you do? 1) Do I have any new credit cards with high minimum spend requirements? 2) Did I get any good targeted spend offers on any cards? Thanks. Are you still spending $250k on Delta cards for Diamond? Yep. Actually $500K! ($250K for me and $250K for my wife). We’ve continued to get huge value from diamond status, especially global upgrades, the ability to guest people into SkyClubs, and ability to gift Gold status. And of course we earn boatloads of Delta miles in the process. Thanks !! Now I know for sure how u get ur points no need for Flipping like I do. How are you doing it if Amex has put down a hammer on buying gift cards, etc. Are you just putting taxes on it? Simon mall is out too, right? I’d love to pick your brain. Good Post once again .I’ll be getting the Capital One Venture card in March (ur link) if they will have me . I need a card for hotels in EZE which I’ll be there 12+ nites .. The Altitude frustrates me. I’m a heavy mobile pay user. Closed my Radisson personal 4 months before this card opened and they wouldn’t qualify me. I’m not in a US Bank state, would have to open a USB personal card for a period of time just to qualify for this. Any other known workarounds? Nuts. They won’t let me sign up start my zip code. Any work around a? I tried anyhow by saying I was a customer. Rejected. Great post! Question about these cards: which of these best performing everyday-purchase-cards offers free foreign transactions? As someone who spends most of the year overseas, I often default to my CSR card, which has a pretty terrible base rate of 1 point per $1. What would you recommend to someone outside the US for everyday use? (I’m not in one of the countries that offers the Curve Card you wrote about recently, otherwise I’d probably pair that with AmEx Blue Business or Everyday preferred). Great article. I would also not minimize the value of insurance, ability to return items and extended warranty. Depending on what you are buying these items could far exceed the value of miles that you receive. You are doing it wrong. You ignore the fees and the category limits. You should calculate the cashback taking this two into account. Similar to the difference between the apy and interest rate on mortgage. Your db is great but I can’t compare apples to apples just based on one #. They as in All here do a very good job as for 2.5* travelers (me) or the 5* travelers which is common here ..This is the Best Blog I hope others Up their Game . Lots of space on the Internet for others . I always apply for a CC on the site that tells me the Right one for Me.. True, adding both of those would be good enhancements. Adding annual fees is tricky though: some of the cards with annual fees are worth keeping for their other benefits, not just their category bonuses. Also, if a card has multiple good category bonuses, how do I split up the annual fee? The Amex Gold card is a good example. It has perks ($100 airfare fee reimbursement + up to $120 dining credit) and both 4X grocery and 4X restaurants. Why give American Express and Chase points a 30% bonus for flexibility and not give the same bonus for cash back? Cash can take advantage of sales and special offers with even more flexibility than either American Express or Chase points. US dollars are the most flexible point program, haha. LOL, good question! Note that I didn’t write that they get the bonus for flexibility (did I?) but rather than they make it possible to cherry-pick the best value awards. For example, the chance of getting over 3 cents per point value goes way up. If I want the Ink cash and the Amex Business Everyday, which should I get first in terms of 5/24? Or it doesn’t matter since biz cards don’t show up on the credit report? Thanks!! It doesn’t matter for 5/24, but since Chase is a tougher on approvals, I’d go with Ink Cash first.